Firstly, I want to thank everyone who has bought, played and enjoyed our small game! The project initially started with Henri and I wanting to make something together over a weekend. That weekend quickly became a fortnight, then a month, then 5 months!!! Along the way we invited Niilo and Nathan, who both helped create the soundscape for our cute little platformer and turned it into a very polished experience. We are making a sequel, and we're calling it... WitchWay. We've always wanted to make a Deluxe Edition. We took a break after release, and as we received a lot feedback from people, what this Deluxe Edition entailed has kept changing. We always wanted to address some design issues, improve and add small features... and now that we are ready to work on it again, it made sense for us to start over and bring in some totally new ideas. We are now also using Game Maker Studio 2; a lot of code would need to be rewritten anyway. 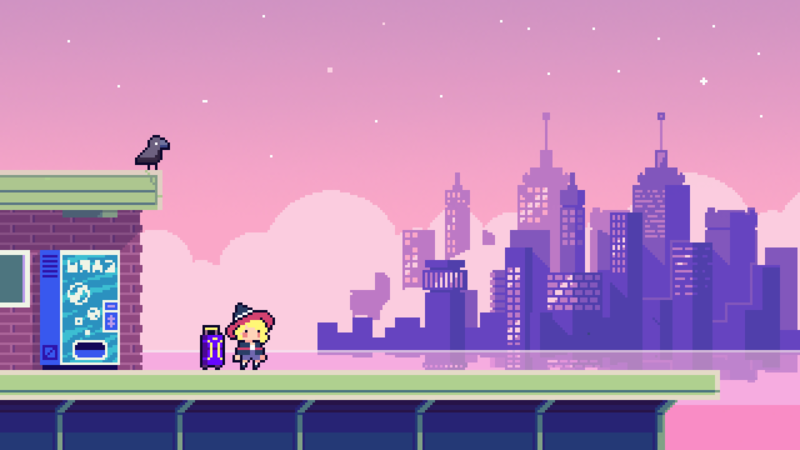 itch.io is a small audience, and it's the only platform WitchWay ever released on. This new game is planned to release on Nintendo Switch and (whatever-major-PC-platform-is-cool-in-2020). Calling the new game WitchWay 2 might confuse more people? Q. So what happens to (the old WitchWay)? Currently the plan is to refer to it as WitchWay Classic. This makes the most sense to us, as Celeste Classic is an example that comes to mind. It will still be available to buy and download, and itch.io will remain the only place you can get it. Q. Can you tell us more about (the new WitchWay)? Soon, probably in a separate post! It's still early in development and there's a lot of work to do, but there are some cool ideas planned. I'm excited about it! The comments are open, so let us know what you think, or if you have any questions! Thanks for reading! P.S You can get WitchWay Classic for 50% off this week! Click here to check out the sale! I really liked this game. Great puzzles and atmosphere, and of course, cute bunnies that you save with hat magic. I appreciated how much you paid attention to the little stuff like how easy it was to keep track of what you had found, and where you found it, so you knew where to look for the stuff that you hadn't. Those sort of affordances are so useful in a game about collecting things from all over a world map, so please keep them in! Regarding the name change, it does bother me when a series has two entries with the same name, but it makes total sense if this is going to be the game that really reaches out to a bigger audience to have the snappiest and most marketable name, and Witchway is a pretty snappy and marketable name. I can forgive it of a tiny indie much more than I can, say, Electronic Arts or Square Enix! On the other hand, 'Witchway Deluxe' kind of gives the impression of additional value, like a premium product. Maybe that would be more enticing to potential customers? I don't know! Awesome! I played this earlier this year and was definitely left wanting more (not that I felt shortchanged or anything for the price I paid). Even if you get the PC version on Steam or whatever, please don't forget your itch.io (DRM-free) audience! BTW, I hope you manage more comprehensive controller support, I never managed to get the original game to recognise my controller. I'm so hype! I love this game! Actually, in the past, a lot of games only got known from their sequels. I don't think many people cared why it was Team Fortress 2, nor looked at what came before it (which is Team Fortress Classic). Well, this is an awesome surprise! This is exciting, I enjoyed WitchWay and I'd love to see it expanded on!